Only a few Christians get classified as a saint and the word literally means a 'holy' person. This means someone different or set apart. Patron saints are saints who were chosen as special protectors or guardians over things like occupations, illnesses, churches, countries, causes, in fact, anything that is important to us. The earliest records show that people and churches were named after apostles and martyrs as early as the fourth century. The patron saint of our church and parish is Saint James who was son of Zebedee and Salome, brother of Saint John the Apostle, and may have been Jesus' cousin. He is actually called Saint James the Greater because he became an Apostle before a different Saint James, known as 'the Lesser'. The 1892 September issue of the Parish Magazine reports on the reason our church is called St James’s: “Our annual Festival is a great day with us, and it is well that it should be so, for it is the continually recurring evidence that we are united together as a community, which claims to have its foundation resting upon the rock of the Church of Christ. Hence has been chosen as our watchword, the name of one of the foremost of her first bulwarks, the first martyr of the apostles, St James. Hence that our parish is specially known by his name. Hence that our Church is dedicated to his memory, and hence, too, that St James’ Day is a red-letter day in our calendar. Our Festival, perhaps, is the time above all others that we should be endeavouring to preserve and consolidate the unity of spirit which should exist in all communities; and on this account it is not at all inapt that the most complete symbol of unity which we could produce, should be the centre round which the celebration of our Festival should seem to cluster.” James appears to have been perhaps the first leader of the Jerusalem church, around which the very first Christians gathered to be nurtured, protected and encouraged in their faith that in Jesus of Nazareth the true nature of God was uniquely revealed. James is depicted artistically in St James's Church in two ways - through a mosaic of him, seen above, and through a shell. The mosaic was given in 1913 in memory of Jane Barnard and the dedication reads 'For many years a most devoted and unselfish parish worker'. A mosaic was, at the time, an acceptable artistic depiction of a saint when a statue or icon probably would not have been. In the mosaic, James is seen holding a staff - perhaps a pilgrim's staff. He is also holding a book inscribed with a cross with a shell in the middle of it. The book is presumably the Gospel - the good news that James was sent out to proclaim. 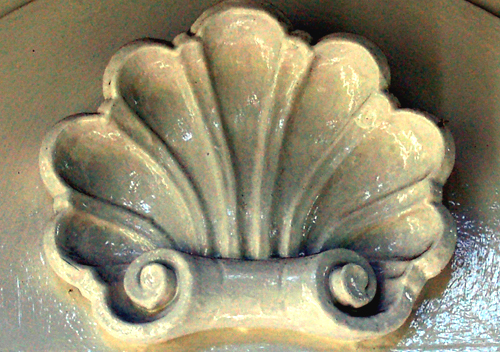 A shell is another symbol of a pilgrim. He is, though, wearing robes which are quite highly decorated. Perhaps they are meant to suggest the robes of a priest, but equally it may be artistic licence. James was a disciple of Saint John the Baptist and a fisherman by trade, living on the shores of the River Jordan. He was one of the first disciples to join Jesus as he left everything when Christ called him to be a fisher of men. James and his brother John, sons of Zebedee, became members of Jesus's earliest group of friends. Along with the other disciples he spent time with Jesus, travelled with him, went to the temple and synagogue with him, and was present at healings and disputes. Jesus called James a 'son of thunder'. St Luke's Gospel tells us that James impetuously called down fire from Heaven on the Samaritans because of their lack of faith. There is a well-known story in St Mark's Gospel where the two brothers ask Jesus for the privilege of sitting at his right and left side in Heaven. James was one of the three Apostles, along with Peter and John, privileged to witness three miraculous events: the healing of Peter's mother-in-law (Matthew 1:29-31); the raising of Jairus's daughter (Mark 5:37-43), and the Transfiguration of Jesus (Mark 9:2-8). Later the gospels record that James was also present in the Garden of Gethsemene on the night before Jesus's crucifixion. It was Peter, James and John who were unable to stay awake - "could you not watch with me for one hour?" After Pentecost, James went on to preach the Gospel in Samaria and Judea. Many stories built up about the apostles and others in the earliest days of Christianity and by the seventh century the story of James having travelled to Spain to preach the gospel was widespread. It is said that Jesus's mother Mary appeared in a vision to James in Spain around 40 AD, standing on a pillar supported by angels. She summoned him back to Jerusalem where he played a big part in the very earliest days of the church there by becoming the first leader of the church in Jerusalem, possibly being the first prototype bishop. He was strong, influential and a man of integrity. In order to please the whim of the Jewish opponents of Christianity, King Herod Agrippa I had James arrested. He refused to deny his faith and the Acts of the Apostles records that he was martyred by beheading around 43 AD, being the first of the Apostles to be martyred. He was buried in Jerusalem but it is claimed that his relics were transferred from Jerusalem to Santiago de Compostela, Spain, in 830 AD where they remain today. In the later middle ages his shrine at Santiago de Compostella was one of the greatest centres of pilgrimage, with thousands of pilgrims making both a physical and spiritual journey to honour this hugely popular saint. 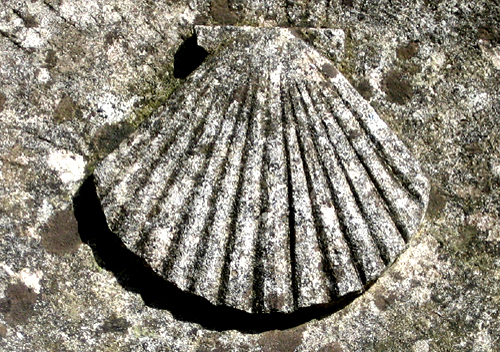 There are cockle shells on the beaches of Galacia in Northern Spain where his relics were brought on the way to Compostela and these were adopted as symbols of Saint James from Medieval times up until the present day. 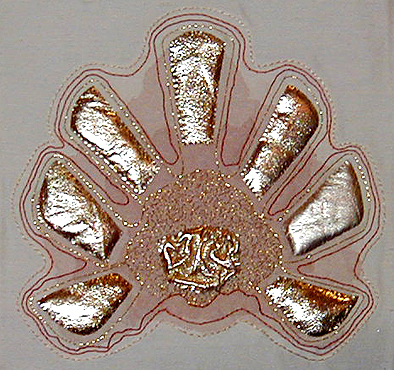 Pilgrims who travel the same way are given a cockle shell at the end of their journey.